IMG_4977, originally uploaded by Mic2006. 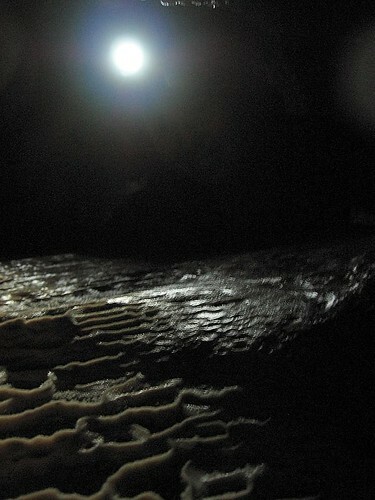 With the appearance of a moon shining down on some alien planet the LED light of one of my fellow cavers illuminates a shelf of rimstone dams. Low bedding plane cavitites stretch out from the main channel in which we stoop. The decorations get more extravagant deeper into those spaces. I can see an extensive shallow pool surrounded by soda straws. 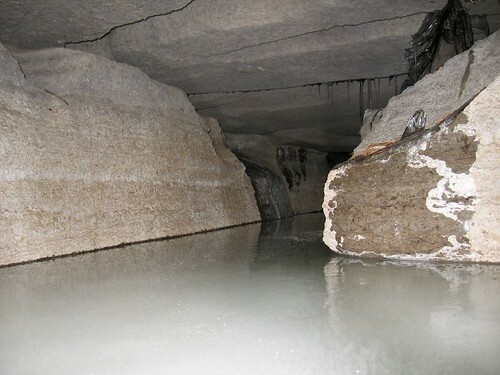 Seeping flowstone blocks an adjacent tunnel. We carefully negotiate our way along the trench; watching for features that are camoflauged on the walls. IMG_4993, originally uploaded by Mic2006. Here we are preparing to enter the tunnels below the escarpment. Not far from here these beautiful straight joints disappear off into darkness. There are five of us in total, Myself (photographing), Jeff Mirza (about to put on his helmet), Dale Holtze (red helmet), Carol Anne Munn and Danni(silhouette). 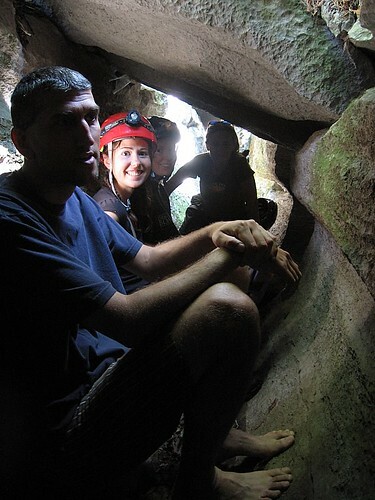 We were all surprised by Jeff’s insistence on caving barefoot. The ground water was freezing and the boulders – jagged – but Jeff is a purist and had savoured the experience in his own special way. IMG_4975, originally uploaded by Mic2006. Stunning-white, calcite rimstone dams. They terraced the shelves to either side – like frothy ripples at the ocean’s edge. The tunnels were a cool respite from the sweltering heat above. IMG_2646, originally uploaded by Mic2006. 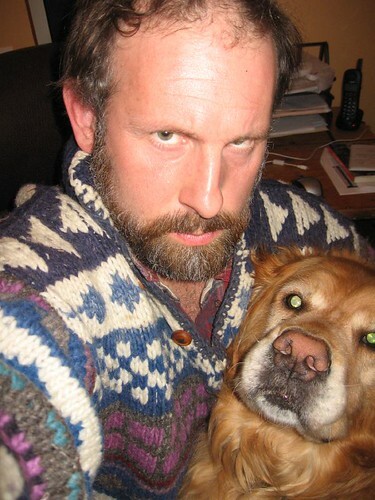 Cave Dog and I collectively form the Ontario chapter of the “Cave Police K-9 unit”. 2) Dont bother the wildlife. 3) Dont touch the formations. 4) Tell someone where you are going and when you will be back. 5) Have a minimum of three light sources per person. We are watching you – Be safe! IMG_2592, originally uploaded by Mic2006. 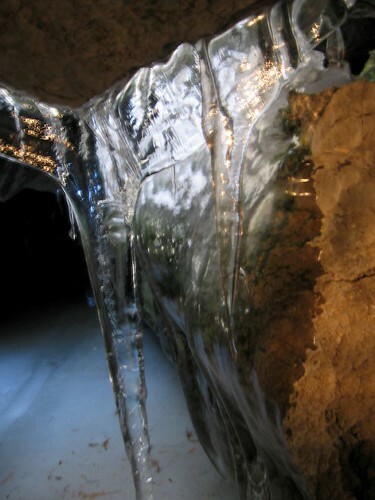 The ice in all its many spectacular forms has accumulated in the tunnels. It is course and milky at my feet, like an ice cream river, and yet hanging like crystal from above. The stability of the formative environment determines something of the shape and clarity. DSCF0048, originally uploaded by Mic2006. 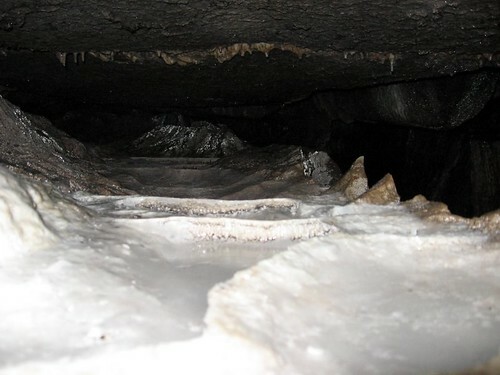 Winter caving needs to be quite selectively undertaken by those who might consider it as certain caves are used as hibernaculums by the province’s bats. Disturbing a bat from its winter sleep could kill it. The water passages in Marmora have in my experience been free of any bats. I suspect there is to much air movement and also the rushing water can vary quite drasticallly in height. Bats could be scoured from their roosts in a heavy spring thaw. In the photo I am dressed in my winter caving outfit. Warmth is essential and though wool precludes the explorer from tight jagged squeezes, of which there are many in Marmora, it maintains its warmth, even when wet. As for the legs, neoprene is fine, but I must admit, stripping off in the snow, my feet felt like they were on fire, it was very painful. Here I am following in along a channel in the ice. This is a section of passage where the water leaves the surface and disappears for a short time under a landscape of juniper and cedar. Numerous side passages lead off to other passages and who knows where. I had wanted to see how the tunnel felt during winter high-flow. The situation soon improved and the water became quite shallow. It is an environment of sparkling ice formations – very beautiful but sadly melting with the warmer weather. IMG_2565, originally uploaded by Mic2006. Marmora is a pretty unique area as far as Ontario caving goes, there are so many possibilities and few have been pushed to their “doable extent”. I have long suspected that there must be some deeper trunk passages beneath the sinking channel around where most of my investigations have taken place. I also suspect the existance of undiscovered tunnels deeper inland; underneath a high forested ridge. Looking up this tunnel, the prospect is a daunting belly crawl across the slushy ice. Eventually the explorer finds their way blocked by frozen pillars that have oozed from the roof. There is a maze of interconnecting passages around here and it was a somewhat challenging exploration under these conditions. For further information on the caving and hiking possibilities in Marmora, check out my book, “Rockwatching; Adventures Above and Below Ontario”. You should find a copy in your local bookstore. NOTE: Some might recognize this picture from an earlier post but unfortunatly, I had deleted it, I was not clear about how Flickr worked at the time.